Paranur Mahatma Sri Sri Krishna Premi Maharaj inaugurated Chaitanya Kuteeram on 26th September 2007. 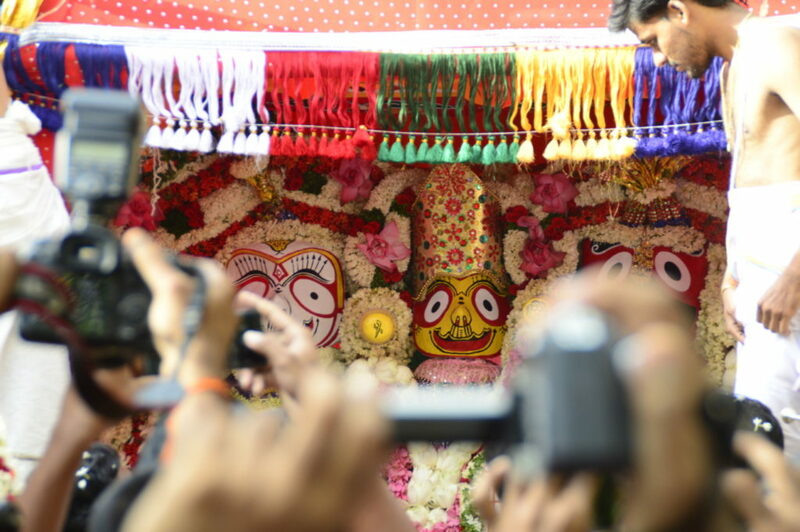 The presiding deities here are Sri Jagannatha, Sri Balabadra, Sri Subadhra Devi, Chaitanya Mahaprabhu and Swami Nityananda. 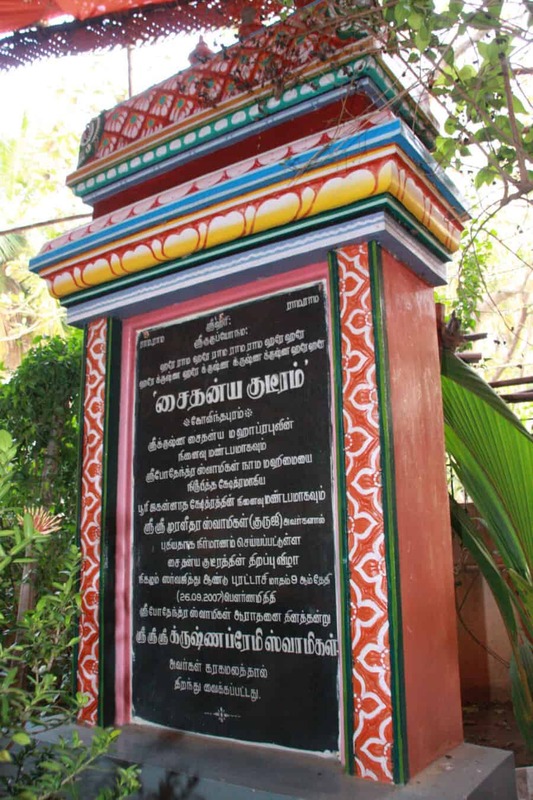 Govindapuram is a the holy kshetra of the jeeva samadhi of Bagavan Nama Bodhendra Saraswathi Swamigal. 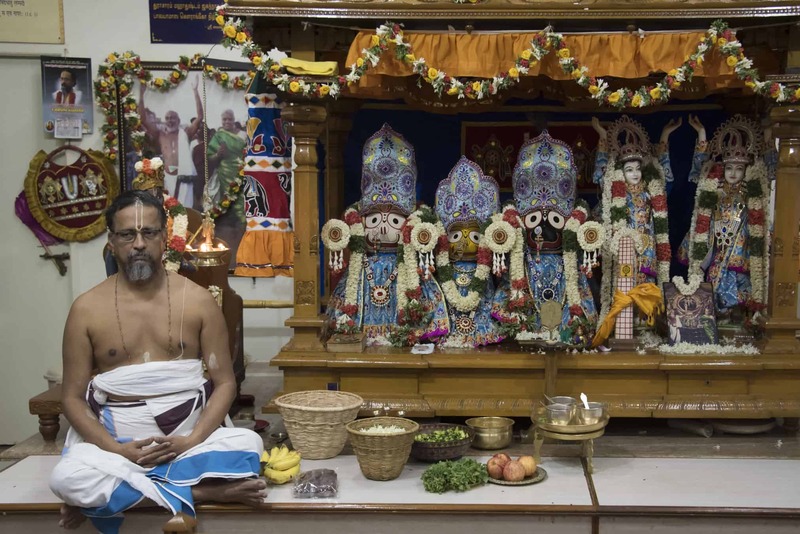 It is most significant because, in this Kali Yuga, the path of nama sankeertanam propagated by Sri Swamiji, was given as Nama Siddhantha by Bagavan Nama Bodhendra Saraswathi Swamigal in his grantha, Bagavan Namamritha Rasodayam. It was the desire of Sri Sri Anna that akhanda Mahamantra keertan should happen in the place of Bagavan Nama Bodhendra Swamigal. He conveyed this desire to Sri Swamiji, after which we acquired a land adjacent to Bodhendral adhishtanam and established a bajana matam called Chaitanya Kuteeram where akhanda mahamantra kirtan and anna dhaanam takes place every day. 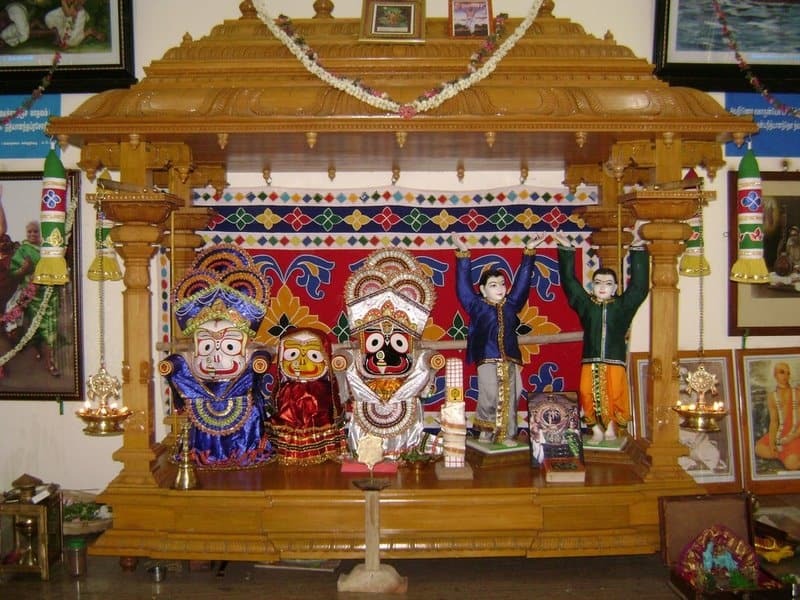 This place is a confluence of the two great saints who propagated the path of Nama Kirtan – Sri Chaitanya Mahaprabhu and Bagavan Nama Bodendhra Saraswati Swamigal – because it was unto Swami Jagannatha at Puri, that Chaitanya Mahaprabhu finally merged, and Swami Bodhendral went to Puri on his Guru’s instructions, and obtained granthas on nama from Jagannatha Kavi and Lakshmidara Kavi from which, he bestowed nama sidhdhantha. 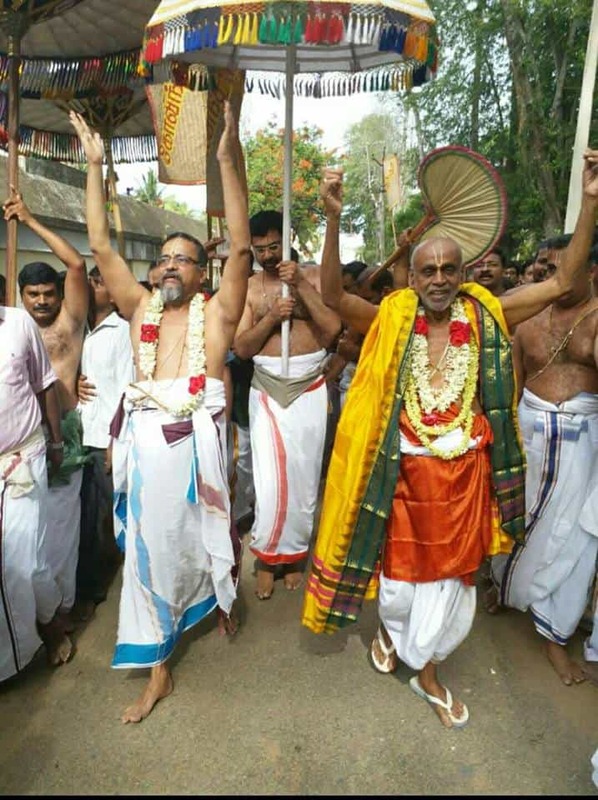 When Sri Swamiji wanted to look for a place in Govindapuram, a few devotees were appointed on the task to look out for a place. At one time when Sri Swamiji was travelling for a satsang programme elsewhere, a few properties details were conveyed to Sri Swamiji. Sri Swamiji decided on the current property and it was finalised. Only after finalising and purchasing, Sri Swamiji came to see the place. It was a pleasant surprise when we got to know that during Sri Swamiji’s wandering phase when he used to visited Govindapuram, it was not so developed. There were only coconut trees on either side of the road. 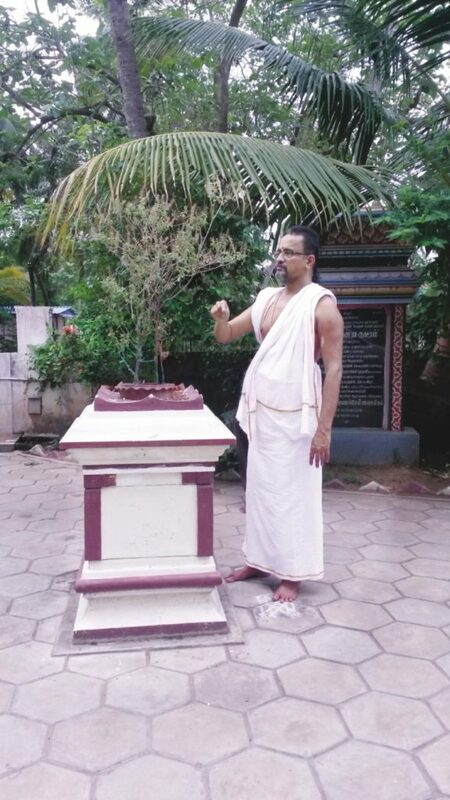 At exactly the same spot where Sri Swamiji used to sit under a few coconut trees and do Bagavata parayanam and japa dhyanam, is where Chaitanya kuteeram is located today, as if divinely marked for us! During Sri Swamiji’s childhood, his paternal aunt used to reside in a village called Tirumangalakudi on the opposite banks of Cauvery where the Veeracholan river flowed by. Whenever Shri Swamiji visited his aunt as a child, even in those days, he was drawn to Bodhendral ever since he saw the place. 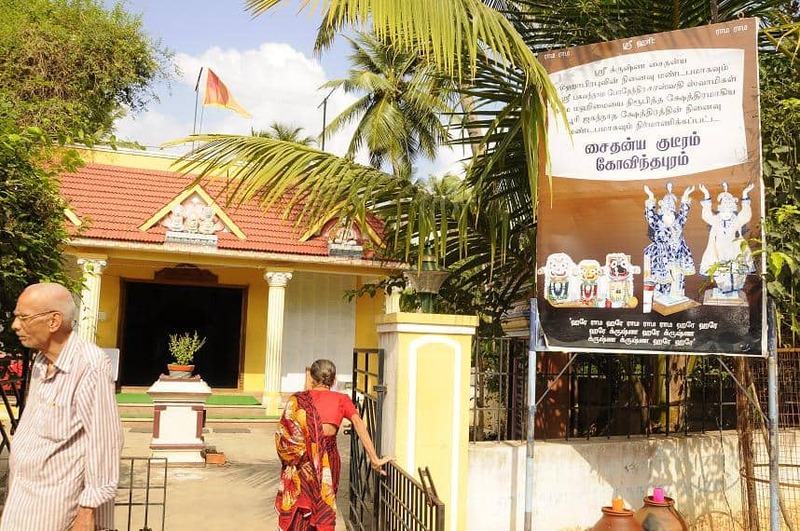 He has told his childhood friends that after a certain period of time he would go off to Govindapuram for good, and that there was some divine connect between him and that place. Today our place is located exactly in that village.